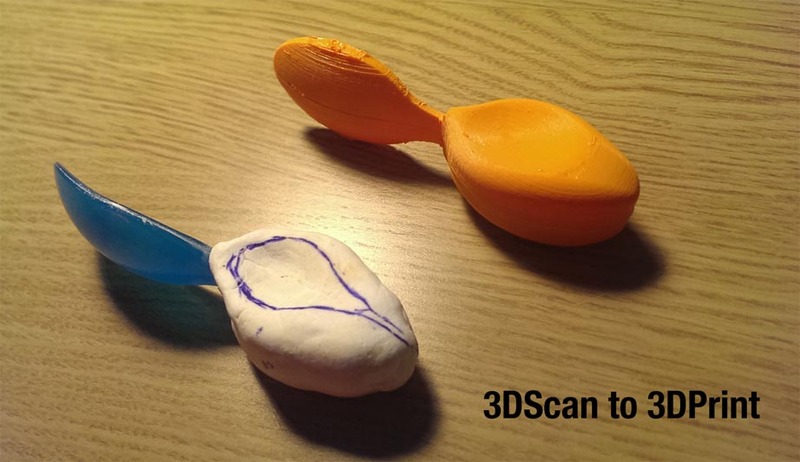 We are pleased to say Doddl is now a success story and nothing gives us greater satisfaction having enabled this through solid research and development methods and practices. The chaps at Doddl ran with it, having the tenacity to push forwards and take the product to market. Doddl has won wide acclaim from the likes of; Theo Paphitis, The Gadget Show Live – British Inventor Project and the Mum and Baby Show. Doddl Started out life as an idea in Client Catherine Dodds head. 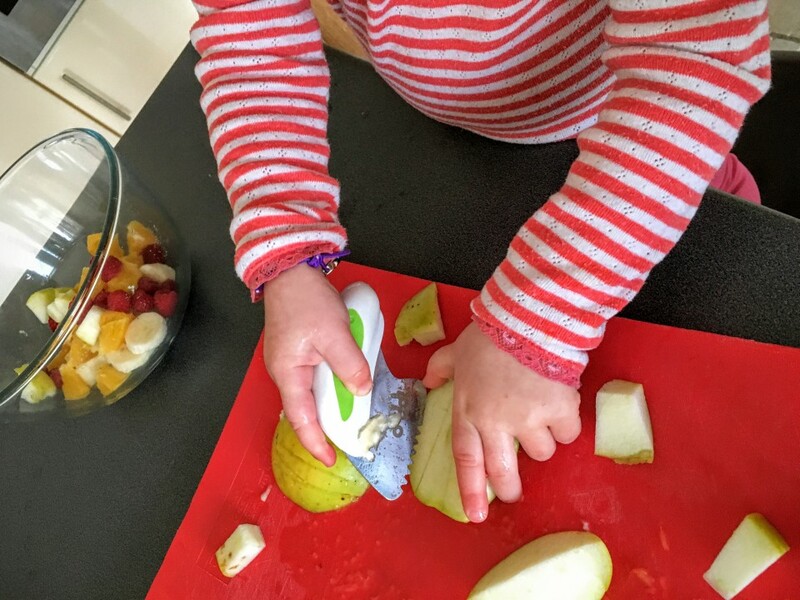 Catherine noted when her child broke the handle of her plastic fork and then proceeded to eat more effectively with the handle removed, that perhaps there was room for shaking up the market of children’s cutlery dominated by big brands like OxO Tots and Tommee Tippee. 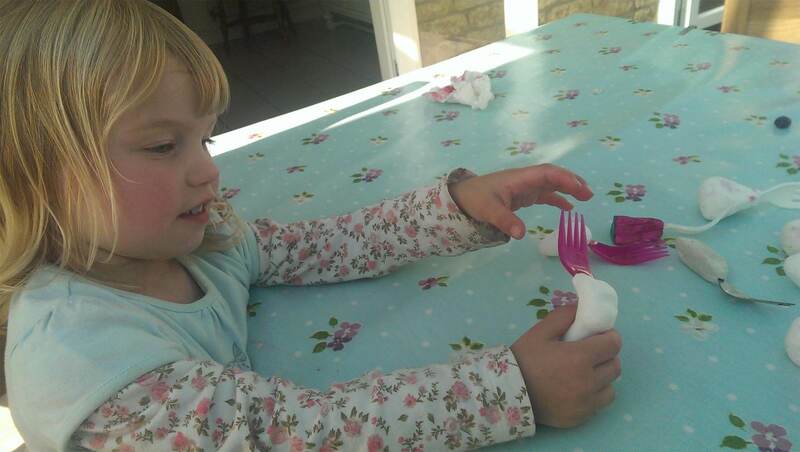 Catherine had observed there was a gap in the market for better cutlery, as some children’s motor skill development is different to others, nothing available in the big retailers seemed to work that well. As we learned through our extensive research with Norton Colleges child development specialist who worked alongside us in our six month research and development, ergonomics focused project, the rate of development in these areas can vary widely with gender and age. Further still there are studies that link pincer grip development with improved writing and some studied indicated a link with early weaning onto solids with an increased linguistic ability of the child. So could it be that due to the limitations of the cutlery some kids were being weaned later on, which could in some way be impacting their ability to form letters and words vocally. Catherine had started making some shapes herself as seen below, this is where we engaged with her, to assess alongside our own work, how well any of these forms might function. We take our inspiration from natural systems and treat this as natural selection as far as designs are concerned. We engaged with local nurseries and countless grape eating and banana chopping sessions with the loveliest of little people, until we along with Child Development Specialist from Norton College, observed some clear winners. The initial brief was to develop a handle that promoted pincer grip that could be used on a fork. In-fact the original working title was Forkeez. 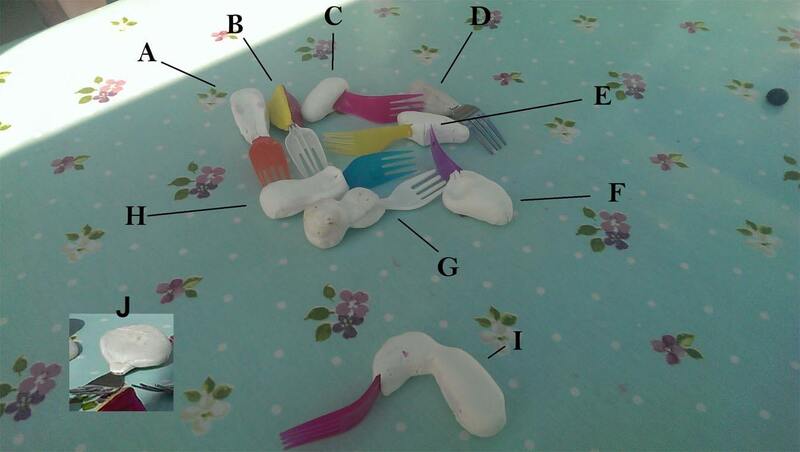 Using the very simple and repeatable task of placing grapes and or peas from one bowl to another, across groups of Boys and Girls , spanning in age from 2-4 years with a selection of grips made in modeling clay. The interesting thing about how forks are used in particular which makes them unique , is the user inverts a fork to stab at a grape or sausage, but then rotates to use as a scoop for things like peas. Our client was fortunate enough to receive funding for further work with the MAS -Product Development Center. As a consultancy we wanted to broaden the scope for the commercial case, to give the project and brand a wider market presence. 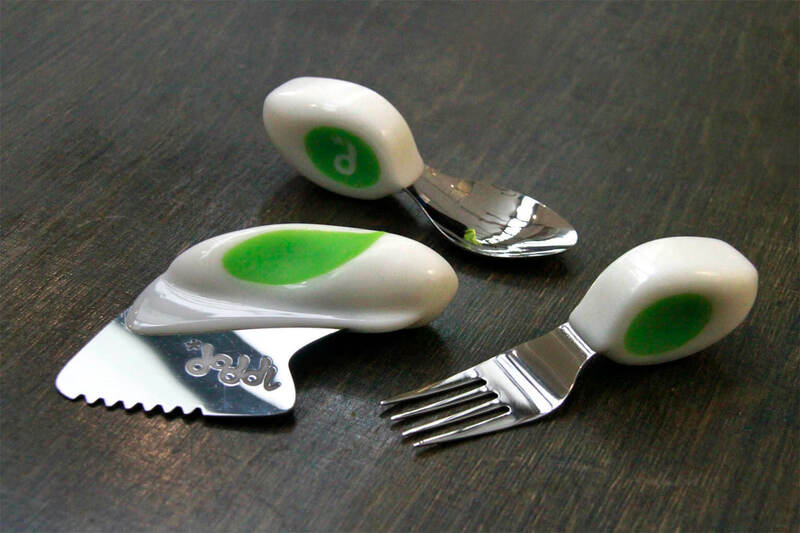 For this reason we encouraged the brief to evolve into development of a Knife, Fork & Spoon Set. 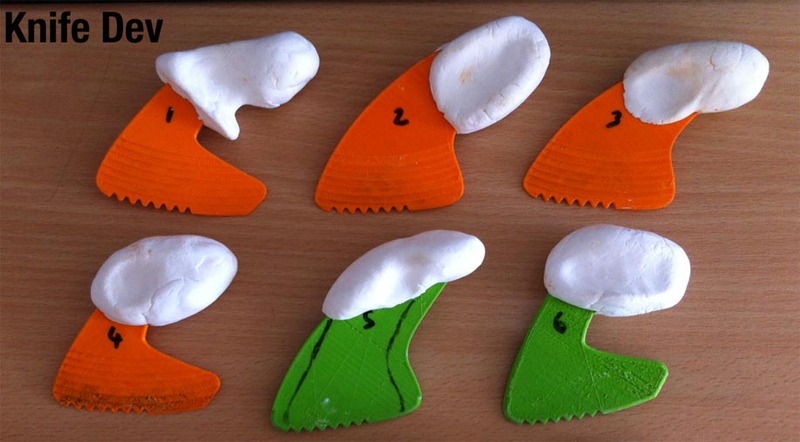 From the first contact with the sample group of children it was evident that children do not have the wrist strength, due to the cartilage structure being underdeveloped and impossible of translating large loads, for this reason we looked to reduce the mechanical dis-advantage of most knives and moved handle over the top of the work piece. The set below our first list of prototype blades and handles. Critical to the specification was researching the correct materials, including soft touch materials that pose the least risk of leaching endocrine distributors sometimes present in some elastomeric materials. We even retro tested a leading brands product which claimed to be BPA free, we found this sample failed the specified test. So our plastics specification lead us into an exploring what TPV, TPE and TPO options existed internationally, due to dish washer heat cycles and fatty food migration this had to be the best material of choice to allow our twin shot overmoulding of the handle which itself was insert molded over the Stainless Steel Cutlery head / Blade. 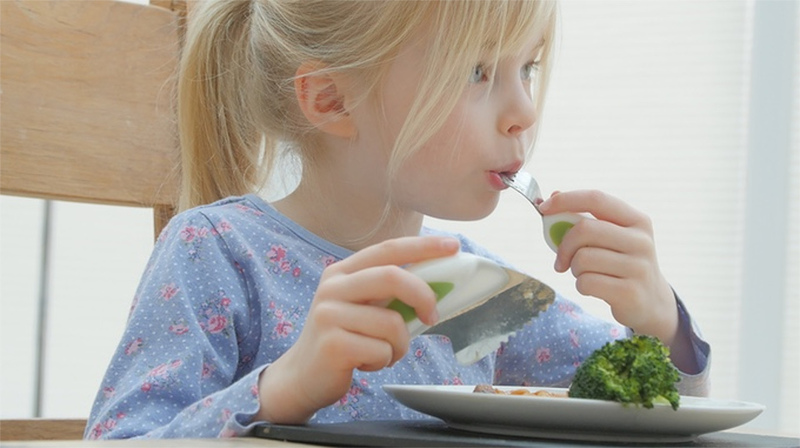 Phelps Innovation approached us with a simple idea, to develop one of the worlds leading research led Ergonomic Cutlery Items for Kids. They knew what the problem was, so many kids were struggling through mealtimes sometimes measured by tears and the amount of food on the floor. What they observed was that even kids as old as 4 could still be struggling. We set out to solve the design challenge and commercial opportunity to make what is now the award winning Doddl available at John Lewis.